The first draft of the Ferme de Balingue, formerly called « Ferme du Bois d’Enghien », dates back to 1230. In the fourteenth century, the main mansion of this square farm, surrounded by moats and ramparts was a lordship. The stables, annexes and the barn were added in 1719; a little further in time a horse farm, including an equestrian center were developed. The current owners who acquired this property a little over twenty years ago, were seduced by its’ charm and breathtaking surroundings immediately. After years of transformation, they have completely renovated the residence with authenticity and charm to preserve its’ typical setting and character. You will access the courtyard through an arch. At the top of a small staircase, you will rejoice of a magnificent panoramic view of the surroundings. This lordship originally a freehold (free land), depending only on God and the sun. The Ferme de Balingue was founded by a man named Baldo. The suffix "ing" or "ghien" makes suggests a Saxon origin. "Inga" standing for: the house, the clan. Balingue (Baulenghien in roman, "Ald" in the language of Oil becomes "the") and means "The house / the Baldo clan." In 1258, the property belonged to Colard of Baulenghien. Indeed, in 1268, a charter Cambron cites a Colard Baulenghien who lived and owned a wood near Enghien’s woods. One hundred years later, the estate will be cited as stronghold nr. 2 and nr. 3 of Enghien’s lordship, the stronghold 3 with the high court and manorial rights on thirty hectares located between Wippelberg (called today the Bois de l’Écluse) and La Ferme du Tierne. 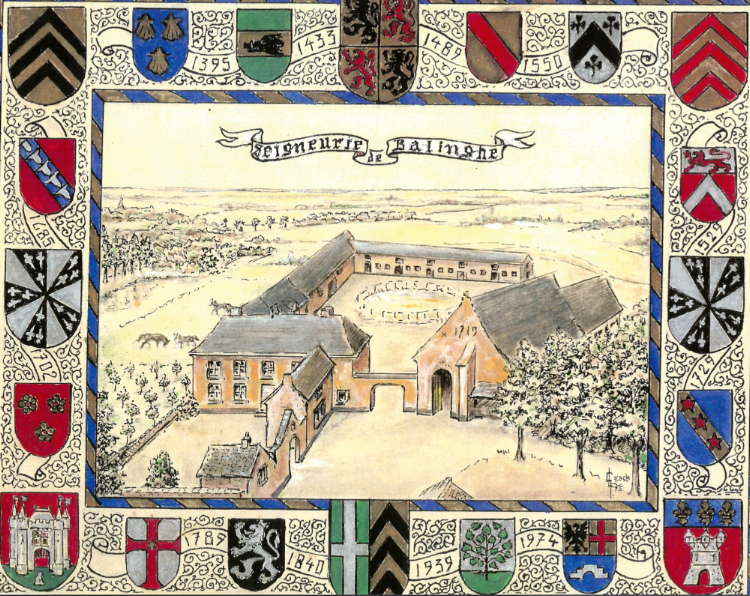 In June 1298, four bonniers of wood (old measure of land corresponding to 1.40 hectares in Belgium in the Hainaut), held in freehold are given to the Abbey of Cambron by Gilles or Égide de Hoves. The act was signed at the cemetery in front of the allodial court in the presence of Pierre de Baulenghien (successor of Colard), Jehan of Wainbiert and Claus-Christian Fordes, all three of them freeholders and noble men of Hoves (in feudal times, a freeholder was a free peasant). Jehan, a priest and "parishioner" of Hoves witnessed the signature of the act. These titles are a whole program for life: intercessor between God and the faithful who work at their service to provide them with the bread of the word of God and the sacraments: baptism, penance, the celebration of the Eucharist, marriage and the last impartation which prepares the passage to glory. Henri of Abliaux will become its’ owner in 1365 and then later bequeathe it to his son Jehan. In 1489, the manor belongs to Jehan de Ligne; his descendants kept it until 1551, when François de Spiennes acquires it and his heirs inherit the until 1685. It was then ceded to François de la Barre, whose coat of arms can still be seen above the door of the curate's garden. On January 5, 1702, the Duchess of Arenberg, Marie-Henriette, granted high justice to the great fief of Balingue, while the fief number three already possessed it. A pillory was also erected at the corner of the Kwadestraat and the street of Balingue. At the beginning of the eighteenth century, a chatelain built a domestic chapel in which the Sunday Mass took place. In 1749, the priest of Hoves, Jean De Smet visited it and found it "in good order". The chapel didn't last long, since in 1775 the priest of Marcq, N. Walraevens no longer quotes it in the report he transmitted to the Bishop of Cambrai. In 1840, the entire farm was sold to J.B. Begens. In 1891, it belonged to the widow Demaret-Goblet, a rentier at Chatelet. She died in 1968, without descendants, and bequeaths all its properties to philanthropic works. The Ferme de Balingue is sold to the company "Consortium de parking" which resells it in June 1973 to Mr. Urban. The latter sold it in 1992 to the current owner. The barn carries the 1719 vintage and reminds us that it was at the beginning of the 18th century that the present castle completely replaced the original half-timbered castle.